The Trump administration ignored public opinion and human rights last month when it launched a rushed 60-day process to lease for oil and gas development in the coastal plain of the Arctic National Wildlife Refuge. 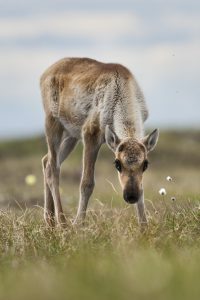 The action violates the cultural foundation of the Gwich’in people, who consider the coastal plain sacred because of its role as a nursery for the Porcupine caribou herd. Now, Alaskans and American can stand with the Gwich’in. The U.S. Department of the Interior continues its hasty process this month by announcing its public meeting schedule starting on May 22. This scoping process will determine what the agency considers and analyzes when doing the Environmental Impact Statement for oil and gas leases in the coastal plain. What is scoping, and why should I comment? What the public says during scoping hearings and in comments submitted through June 19 will influence the scope of analysis in the Environmental Impact Statement. In other words, saying something during the scoping process gives Alaskans a voice in what the agency considers and evaluates. 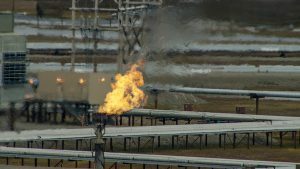 Issues of concern can range from the impact of more fossil fuel extraction on climate change to concerns about how oil and gas activities affect public health, wildlife and habitat, cultural practices, subsistence activities, and other businesses and sectors that rely on intact ecosystems and undeveloped areas. The footprint of any oil and gas development in the Arctic Refuge will turn it into another Prudhoe Bay. Roads, pipelines, power infrastructure, and much more will create a web of development on an iconic place Americans have fought to protect for over 50 years. The Arctic Refuge is the biggest and wildest national wildlife refuge, and the coastal plain is the biological heart of it. A President’s call to drill in the Arctic Refuge “because he can” dishonors an American legacy. Make your voice heard and join the many Alaskans and people across America by commenting online or participating at a meeting to speak out in opposition to all oil and gas activities in the Arctic Refuge. Defend the Sacred and Alaska Rising Tide have put together a series of art actions to protect the Arctic, including one in Anchorage on May 22. 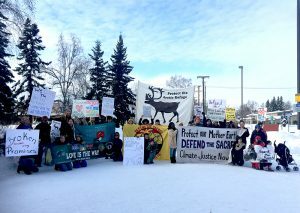 Rally for the Arctic in Fairbanks March 7, 2018. The DOI hearing schedule includes only four remote communities. May 22: Kaktovik – Community Hall – 6:30 p.m.
May 24: Arctic Village – Community Hall – 10 a.m.
May 31: Utqiagvik – Iñupiat Heritage Center – 5 p.m.
June 12: Venetie – Village of Venetie Tribal Hall – 10 a.m.
May 29: Fairbanks, Carlson Center, 3-4:30 p.m. open house; 4:30-9 p.m. presentation and comment period. May 30: Anchorage, Dena’ina Center, 3-4:30 p.m. open house; 4:30-9 p.m. presentation and comment period. June 15: Washington, D.C., National Housing Center, 3-4:30 p.m. open house; 4:30-9 p.m. presentation and comment period. The public can also comment via the proposed project’s website or via email, blm_ak_coastalplain_eis@blm.gov, through June 19, 2018.